Comments-Turner Bend is located at the junction of The Pig Trail Scenic Byway and the National Wild and Scenic Mulberry River in the heart of the Ozark Mountains. Interstate 40 is just 11 miles to the south and fast growing Northwest Arkansas is only an hour away. This 14-acre property has a beautiful custom built home with a waterfall in back. This home currently serves as the owner/managers residence but would bring in substantial revenue as a rental lodge. Near the main house is the handsome two story cottage which has a hiking trail leaving out the back door. Visitors pose for photos in front of the eye catching Turner Bend store every day. All structures have been built within the last 30 years and are in very good repair. The property has several tons of impressive rock work including a massive retaining wall and three rock landings to the Mulberry. Natural gas, city water, high speed internet and weekly trash service are some of the amenities. Turner Bend is an iconic 105-year-old business that has had the same owner / manager for the last 35 years. Every spring kayakers and canoeists come to Turner Bend from all states within a 500-mile radius to ride the Mulberry. Motorcyclists rave about the Pig Trail and rarely pass Turner Bend by without stopping. Hunters, tourists, ORV riders, and locals around out the cast of characters that frequent Turner Bend. 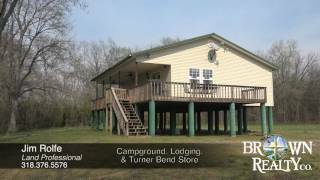 The immaculate campground on the property compliments the store and boat rental business. The business has a complete fleet of canoes, kayaks, rafts, vans, trailers, and all the necessary equipment, along with a store brimming with every kind of merchandise and is well known for its almost famous deli sandwiches. Turner Bend has won numerous awards for conservation efforts and has an impeccable reputation. This would make a perfect place for a family to move to the mountains and start a new chapter in their life.